We’re joining our friends at Reddit, Tumblr, Wikipedia, Boing Boing, and Google today in raising awareness of SOPA/PIPA legislation in the US Congress. These bills aim to change the very structure of the internet by allowing corporations and the US government to block access to domain names, and they circumvent the DMCA provisions that have made innovation possible on the web. This includes the Hype Machine, and we stand with the 1000+ tech companies, engineers, and public advocacy groups that have spoken out against the proposed laws. A vote on PIPA is scheduled for January 24. Read Joi Ito’s great, concise explanation of why SOPA/PIPA must not be allowed to pass, sign the petition, call your representatives, and urge them not to censor the internet. Every Hype Machine Zeitgeist tabulates the best music of the year, as decided by music bloggers. 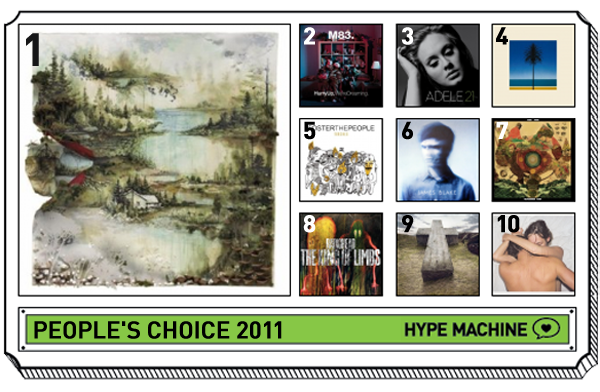 This time, we thought it would be interesting to open the voting up to everybody and find out what albums everyone loved in 2011. We built an album picker stocked with all albums released in 2011 according to Discogs, which over 4300 people used to create and share their top album plaques. The final rank was calculated by assigning points to every album (#1=15 points, 2=14, 3=13, etc), and tallying up the total score. Together with our annual blogger Top 50, the People’s Choice paints a fuller picture of the rich musical landscape of 2011. Explore both lists; you may discover a great album you’ve missed out on the first time around. The Hype Machine Music Blog Zeitgeist 2011 is ALIVE! We will be revealing 10 of the year’s Top 50 artists and albums every day, with fresh mixes of the Top 50 tracks. Stick around till Monday to find out who made it to the Top 10. Top 50 Artists: We calculated the total number of songs by each band posted in 2011 by blogs listed on the Hype Machine. Nicholas Gurewitch (The Perry Bible Fellowship) illustrated this musical landscape as a big, beautiful poster, and we added interactive map navigation for easy scrolling. Drag around, zoom all the way in, and click artist names to hear tracks by the 50 most-blogged artists of 2011. You can buy the full 18×24″ print here. Top 50 Albums: We processed more than 400 blogger Top 10 lists and weighed each album according to position for our final list of 50. The maps displayed with each album continue to map the music of 2011. Top 50 Songs: We continued to collaborate with some of the year’s top producers on custom Hype Machine mixes featuring the top tracks of 2011. The full list will be published on Monday. Thank you, bloggers, for another great year of music discovery. Big thanks to Jeff from Heart On A Stick for starting the Zeitgeist tradition; David from Largehearted Boy for collecting the lists; Cameron, Matt, and Katie for entering the album data; and the entire Hype Machine team for accepting that no one sleeps until the Zeitgeist is live. And thank you, for knowing that there’s always more music out there, and wanting to find it.